It would really be an ambitious project to generate your own electricity for your general household usage. Though it is difficult but not at all impossible. This might be quite challenging particularly if you don’t have much knowledge or experience on renewable energy sources such as solar. To power your entire home by solar energy requires time and also serious investment on your part, but if you are dedicated to the idea, it can be done. 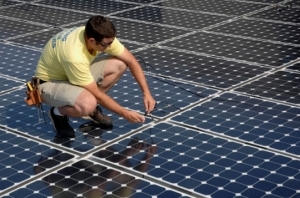 Here are 3 things to consider when you are planning to generate homemade solar energy. This is one element many DIYers lack when they are planning to hook their home up with solar power and that is “patience”. There is no way you can get your home off the grid after building a single Photovoltaic (PV) solar panel. What you’ll need is multiple numbers of solar panels linked together in series to generate sufficient electricity for your home. To do that, you have to spend a lot of time meticulously arranging and soldering all the connecting wires together. When you have completed that portion of the project, you can start using solar panels to reduce your monthly power bills. When you feel that your power bills are almost zero, this is the time when you can actually get the power disconnected from the local grid. But for all of that to happen, it will take some time. Getting the power requirement calculations right. Before you know how many PV panels are needed, you have to be aware of the total power consumption of your entire home. Don’t worry, it is quite easy to make the calculation. An American home requires an average of 588 Kilowatt (kWh)-hours per month, this can vary as it depends upon the size of your home and other power needs. Nonetheless, that figure can be used as the benchmark. This number also depends upon the climatic conditions because in summers, many homes consume double the power as the need of air conditioners increase. Such calculations will help you to arrive at the total energy requirement per month. You can now calculate how many solar panels are required to power your entire home. When you have that number, you can now arrive at the right total units of solar cells needed. Again there are other parameters which you will have to keep in mind, as the electricity generation by the individual solar cell can vary. This depends large on factors such as size, location, time of the year, clouds coverage etc. If you are hitting a road block and can’t calculate the numbers, you may need to get professional help from solar suppliers who can supply you the reliable number of average watts produced per solar cell per day. Next, you will have to calculate how many batteries you require to store the power produced by the Photovoltaic cells during day time. During evening and night time, your power needs can be met by the power stored in the batteries. Wet batteries which are basically lead-acid batteries are not suitable for solar power. What you will need are marine type deep cycle battery to make up your home battery bank. Batteries which are based on deep cycle gel known as AGM are more expensive, but they can last much longer. It is a heavy initial investment but it has a longer lifespan thus saving you money in the long run. When you’ve calculated the total energy needs of your house on a daily basis, now you can choose the battery type as per its storage capacity. This calculation will give you a fair idea about the total number of batteries you will need to power your home. Reducing your household power consumption. Lastly, to make a DIY home solar power system a success, you have to start thinking about reducing your home energy consumption. When we use electricity from the grid, we don’t think of energy wastage because there is an ample supply of power. However, to go off grid, you have to take the limited power availability from your battery bank into consideration. Firstly, you have to ensure the solar panels are in peak power producing condition. Next, you have to start thinking and adopting ways to reducing your household energy usage. A large portion of the work here is to change your family members’ power usage habits. Gone are the days where you can leave the lights on in a room with no occupant. Shifting from grid power to solar power requires a change in your lifestyle. Because there is a finite amount of power in the battery units, your home lifestyle now revolves around the availability of power in the batteries. When there is no sun light to activate the solar cells, you would have to forgo some conveniences at home. It is a tough decision but there are tremendous financial benefits to living off the power grid. Anyone can make the shift to be self-sufficient but it does require a lot of scarify.